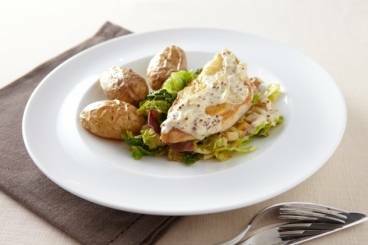 Oven roasted pheasant breast served on a bed of savoy cabbage with a mustard sauce and thyme roasted new potatoes. Use a sharp knife to finely slice the cabbage. Peel the carrots and the celeriac and then dice into small cubes. Finely chop the garlic and pick the leaves from the sprigs of thyme. In a wide, heavy-bottomed pan, heat up the duck fat. Add the pancetta, carrot and celeriac dice. Cook until soft. Add the garlic, fry for one minute and then add the savoy cabbage, season with salt and pepper and add the white wine. Cover with a lid and cook until the wine has evaporated and the cabbage is soft. Place the new potatoes in a baking tray. Season with rock salt and black pepper. Add the thyme sprigs and coat the potatoes with the sunflower oil. Roast in the oven for 45 mins until golden brown and cooked through. Season the pheasant breast with salt and pepper. Heat a frying pan and add a tablespoon of vegetable oil. Add the pheasant breasts skin-side down and cook until the skin is golden brown. Transfer to the oven and roast until the meat is firm and the juices run clear from the thickest part of the breast. Slice the onion, celery and garlic finely. Heat a saucepan and sweat the vegetables until soft. Add the white wine and reduce this to a syrup. Add your chicken stock and reduce by two thirds. Add the double cream and the mustard and then season with salt and pepper. To serve: place the cabbage in the middle of the plate with the pheasant breast on top and drizzle the sauce over the pheasant and around the plate.